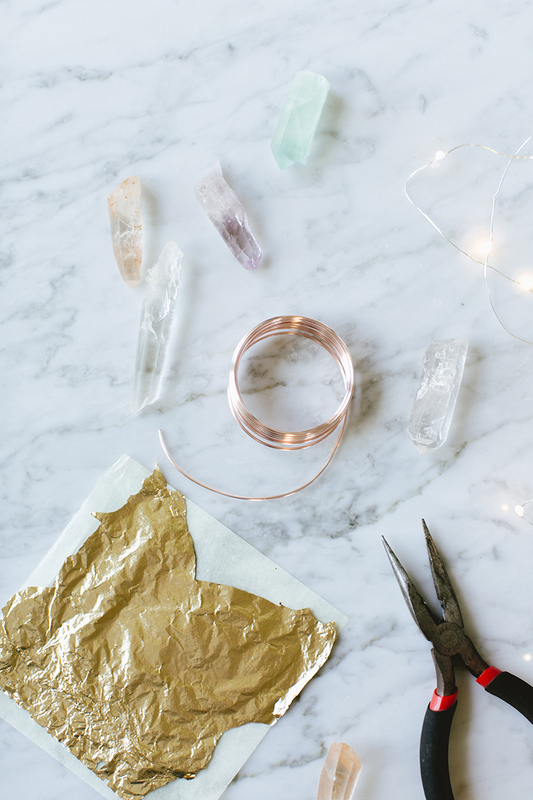 Crystals are having a moment — and why shouldn’t they? Whether or not you believe in their healing and restorative properties, we can all agree that they sure are pretty to look at. 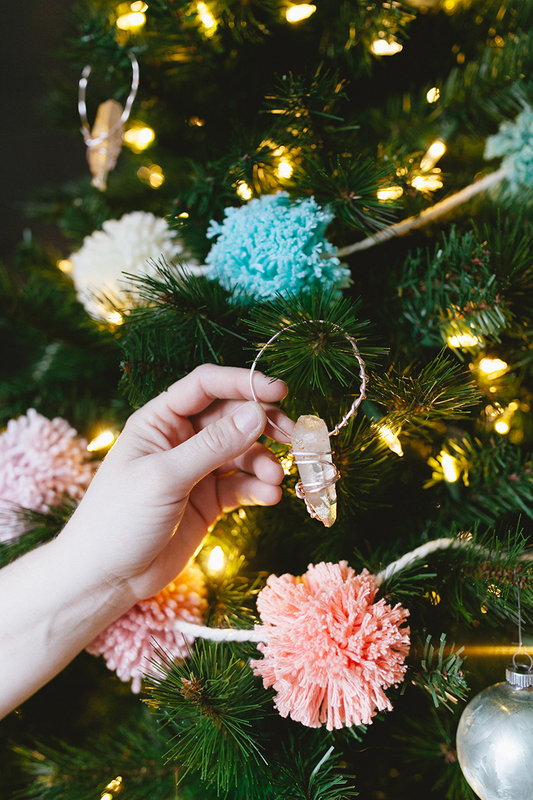 Joanna keeps a lovely collection of crystals scattered around her tiny bungalow (and she just wrote this gift guide for the self-care lovers among us), so it seemed perfectly natural to dust her Christmas tree with some crystals as well. But I had to dress them up a bit first. I wanted to add some luxe details while maintaining the bohemian charm of the crystals, so I wrapped some rose-gold wire around them and finished them off with a dusting of gold leaf — because if you can’t be a little extra during the holidays, when can you? assorted crystals (ours were about 2″ to 3″ long) — we got ours from an amazing local shop called NY Crystals. 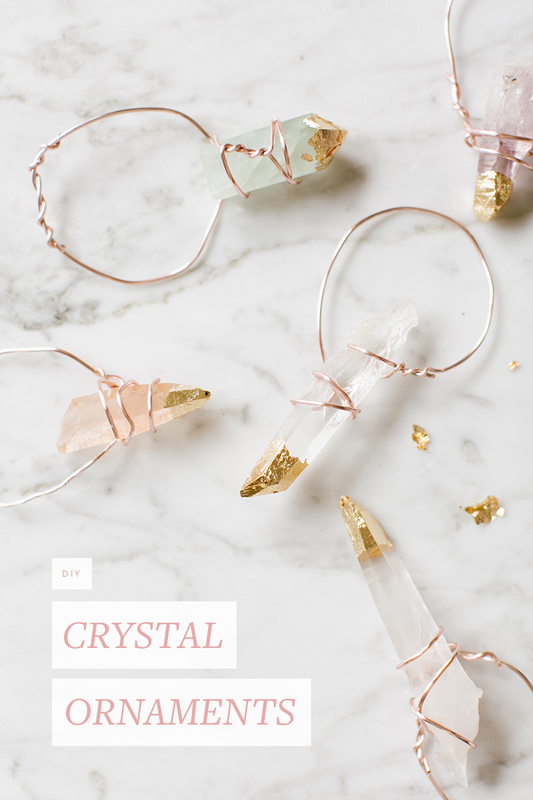 Start off by using your needle-nose pliers to wrap the wire once or twice around the crystal. Then, where the two sides of the wire meet, twist the short side of the wire around the long end to secure it. This will form one side of the loop you’ll use to hang the ornament. Next, estimate about how big you’d like the hanger portion of the wire to be, add a couple of inches so you have some wire to play with, then use your pliers to cut the wire. At this point, you can keep wrapping the wire around the crystal until you’ve achieved the effect you’re looking for. Get creative! But just make sure that crystal stays securely nestled within the wire cage you’ve crafted. Once you’re happy with the look, wrap the end of the wire back up towards the top of the loop to complete the circle. For a beautiful finishing touch, brush a bit of adhesive on the end of your crystal. Let dry for a few seconds so it’s tacky but not wet, then gently brush on some of your gold leaf. You’ll see that the gold will easily stick where you applied the glue and easily brush off where you didn’t. And that’s all there is to it! Each ornament only took me about five or ten minutes to make, which means you can easily fill up your tree with these beauties in the time it takes to watch Love Actually (that totally counts a Christmas movie, right?). What I love about this project is that even though they were designed for your Christmas tree, they can still be used after the holidays! I plan on hanging one or two on my dresser handles to add some zen energy to my often-rushed morning routine. P.S. 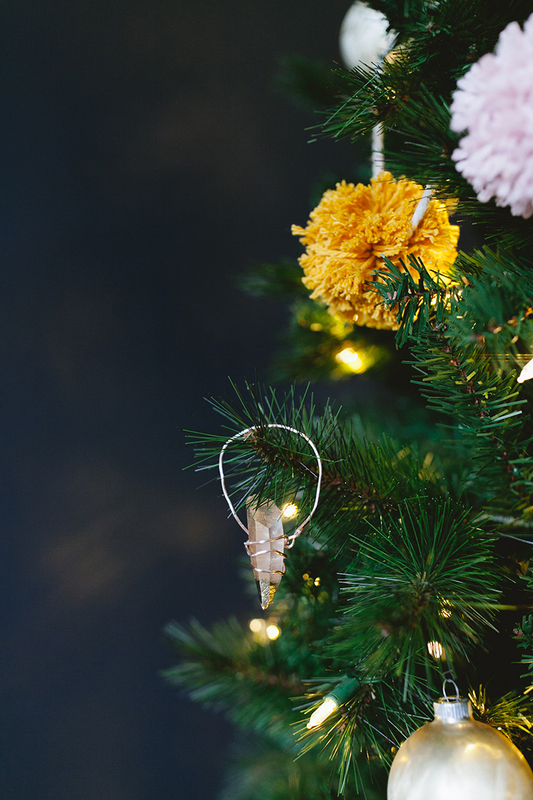 If you like the pom poms on the tree, check out the super-simple pom pom garland tutorial here!